Get A FREE Brochure from "Alta Lodge"
Experience the romance of Alta! Alta Lodge offers a unique and romantic venue for memorable mountain weddings and rehearsal dinners. Located at the top of Little Cottonwood Canyon, our intimate lodge offers outstanding personal service and cuisine along with breathtaking views. From small personal gatherings to grand celebrations, our dedicated staff will assist you with your special event from start to finish, allowing you to relax and enjoy the wedding of your dreams. The Lodge staff focuses on the details of your event so you can fully experience your special occasion. Please mention Salt Lake Bride when you contact Alta Lodge! We recently had our wedding here and it could not have been better. 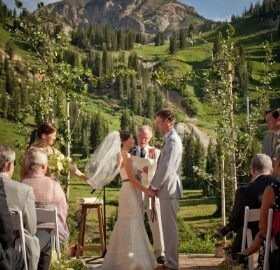 The service Alta Lodge provides takes a ton of stress off of the planning and coordinating. We worked with Maren and she is so ridiculously good at her job. Any questions or concerns we had she was already one step ahead with an answer/suggestion. Our guests as well as us loved the rooms. Very clean and cozy. Waking up to the mountains was fantastic. I got married at The Alta Lodge three weeks ago and it was everything I dreamed of. The location is perfect and full of mountain charm. The food is amazing, especially Sunday brunch and the staff are incredible. Our out of town guests loved visiting the wasatch mountains and having lodging at the wedding venue. I wish I could relive every moment! I don't even know where to start praising the owners and staff of the Alta Lodge. From start to finish the wonderful people at this resort made us feel welcome, appreciated, and enthusiastic about hosting our wedding at this venue. The views alone are to die for, but I will honestly say I have never had a better experience with a company or hotel/resort in my lifetime. Our experience began with Rosie O'Grady and we were then paired with the efficient and wonderful Gabrielle Landau. Planning a wedding at home is difficult, but planning a destination wedding from Ohio can be downright impossible without the right team and planning and I will say Gabi pulled this off without a hitch and was present and available throughout not just the process but before, during and after the wedding itself. I have heard nothing but rave reviews about the food and cake, thanks to the wonderful chef and service staff for ensuring everything was perfect. I would not hesitate to recommend this venue and the staff hands down and have done so already with another friend getting married in the SLC area. A sincere and heartfelt thank you to Gabi, Rosie and the rest fo the staff and owners of Altal Lodge for pulling off a class act and making our special day so memorable. We will forever be grateful and staying from now on at Alta Lodge rather than Snowbird when we come to visit.